Hummingbirds are New World birds that constitute the family Trochilidae. They are among the smallest of birds, most species measuring in the 7.5–13 cm range. Indeed, the smallest extant bird species is a hummingbird, the 5-cm bee hummingbird, weighing less than a U.S. penny. They are known as hummingbirds because of the humming sound created by their beating wings which flap at high frequencies audible to humans. They hover in mid-air at rapid wing-flapping rates, typically around 50 times per second, allowing them also to fly at speeds exceeding 15 m/s, backwards. 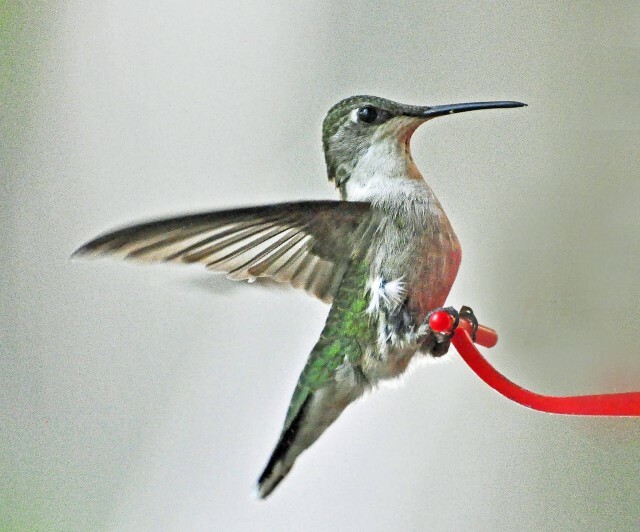 Hummingbirds have the highest metabolism of any homeothermic animal. To conserve energy when food is scarce and nightly when not foraging, they go into torpor, a state similar to hibernation, slowing metabolic rate to 1/15th of its normal rate. Many of the hummingbird species have bright plumage with exotic coloration. In many species, the coloring does not come from pigmentation in the feather structure but instead from prism-like cells within the top layers of the feathers. When light hits these cells, it is split into wavelengths that reflect to the observer in varying degrees of intensity. The hummingbird feather structure acts as a diffraction grating. The result is that, merely by shifting position, a muted-looking bird will suddenly become fiery red or vivid green. 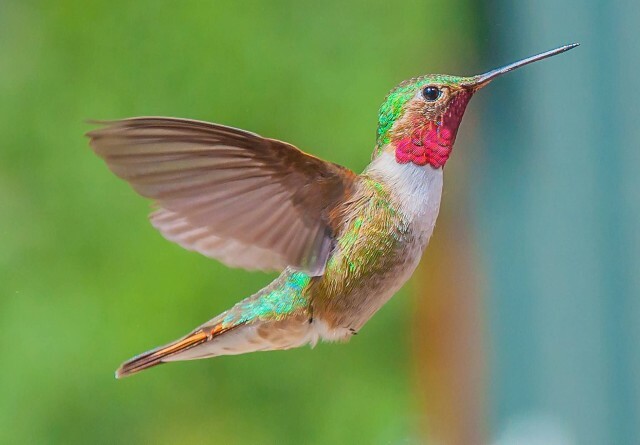 However, not all hummingbird colors are due to the prism feather structure. The rusty browns of Allen’s and rufous hummingbirds come from pigmentation. Iridescent hummingbird colors actually result from a combination of refraction and pigmentation, since the diffraction structures themselves are made of melanin, a pigment. 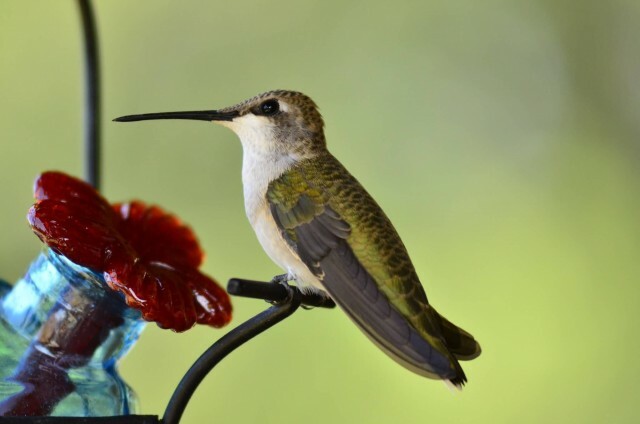 Hummingbirds drink nectar, a sweet liquid inside certain flowers. Like bees, they are able to assess the amount of sugar in the nectar they eat, they normally reject flower types that produce nectar that is less than 10% sugar and prefer those whose sugar content is higher. 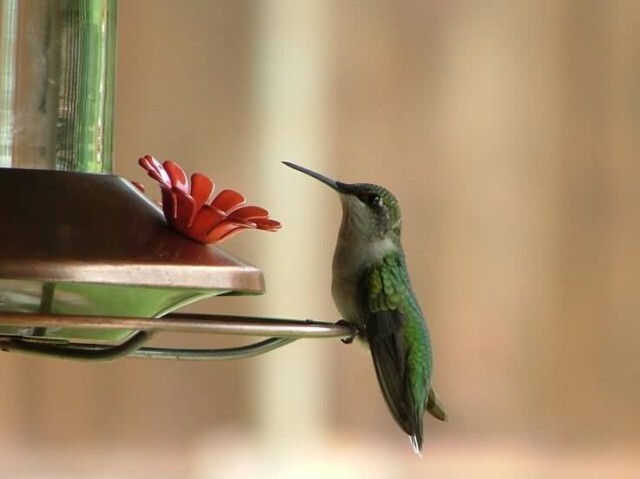 Nectar is a mixture of glucose, fructose and sucrose and is a poor source of nutrients, so hummingbirds meet their needs for protein, amino acids, vitamins, minerals, etc. by preying on insects and spiders. Some species of sunbirds of Africa, southern and southeastern Asia and Australia resemble hummingbirds in appearance and behavior, as do perhaps also the honeyeaters of Australia and Pacific islands. These two groups, however, are not related to hummingbirds, as their resemblance is due to convergent evolution. The hummingbird moth is often mistaken for a hummingbird.